I welcomed myself home with a batch of fresh baked cookies after a weekend trip to Seattle and the #IFBC2013. 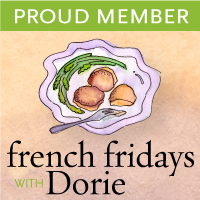 First off I want to say that meeting Dorie Greenspan along with the Doristas (participants in the French Fridays with Dorie -the blogging group cooking their way through Around My French Table for the last 3 years) was the highlight of my weekend adventure in Seattle. When I started my blog it never occurred to me that through blogging I would meet so many nice and interesting people from all over the world. For sure it never occurred to me that I would be spending several days with many of them in Seattle. We drank, ate, talked, attended the conference, walked, laughed, shopped and bonded together during one long very fun weekend. I’m not sure which one of us initially came up with the idea, but when word got around that Dorie was giving the keynote speech at the #IFBC there was a small stampede of Doristas reserving spots at this year’s conference in Seattle. We were honored to have seating reserved for us directly in front of the podium where Dorie delivered her speech. For all of you who were wondering if Dorie talks with her hands -the answer is a resounding Yes! Dorie also gives a compelling keynote address, as in the case of this past weekend where she spoke to a group of food bloggers eager to hear her message. Dorie made an immediate connection with her audience as she shared her experiences working as a professional food writer over the years. It’s very true that as she mentioned many things have changed since she began her career, especially technology. I agree with Dorie’s statement that regardless of the times, what remains constant is the value of hard work and persistence in one’s chosen field. 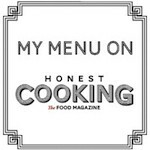 She spoke about the solitary craft of cookbook writing and not knowing if she was connecting with anyone other than her mother until one day a group of bloggers was formed to cook through both her Baking and Around My French Table Cookbooks. I thought about how fortunate we are today with our community of blog readers and the daily interactions with each other that we enjoy. Both the questions from the audience and Dorie’s responses were entertaining, especially about her time working as Julia Child’s assistant -now that’s one claim to fame that not many in this life can make. Dorie’s heartfelt keynote address thrilled all of us in the room and we came away with much appreciated food for thought on both food writing and life. For my group of very fortunate Doristas (French Friday Followers) the special time we spent together and with Dorie will go down as one of life’s extraordinary weekends. I’m in awe of the community that we have all created and going forward hope to keep our connections strong. How often do you meet a group of people you’ve met online through your blog for the first time and spend the weekend laughing with everyone? I can answer that question…Not enough! Once again I was inspired by Dorie Greenspan to bake from her Paris Sweets book, several Doristas brought this cookbook with them to the conference for Dorie to sign. I wish I would have though of that! But, I did the next best thing and baked a batch of Punitions using a recipe Dorie shared from Boulangerie Poilâne in Paris. How I love to live vicariously through the recipe collection of such a remarkable woman like Dorie Greenspan who spends months out of her year living in Paris while collecting fabulous Pastry recipes to share with all of us. I was also inspired by New York Time’s photographer and food stylist Andrew Scrivani who gave two food photography workshops that I attended at the #IFBC. I even painted this board in my lemon verbena shortbread photos green, in honor of that experience. Although, he didn’t mention a word about green boards in either of the workshops-he was still my inspiration-funny how inspiration works. Stay tuned, I will share my thoughts on the photography workshops in my next post. Punitions -adapted from Paris Sweets by Dorie Greenspan. Place the sugar, lemon verbena and lime zest in the bowl of a food processor fitted with the metal blade and process, scraping down as needed, until the lemon verbena is blended into the sugar. Add the butter to the sugar mixture and process, scraping down as necessary until blended and smooth. Add the egg and process until blended. Add the flour all at once and pulse 12-15 times until the dough forms clumps. Remove the dough, divide in half placing on 2 sheets of plastic wrap and press into 2 discs. Chill the dough for several hours or freeze until ready to use. Roll one disc out at a time on a lightly floured surface, until it's about 1/8th inch (4 mm) thick. Using a round or scalloped edge 1&1/2 inch (4 cm) cookie cutter cut out as many cookies as you can and place on the prepared baking sheets, about 1 inch (2.5 cm) apart. The scraps can be gathered together, chilled, rolled out again and baked. Remove from the oven and sprinkle with coarse sugar and the reserved lime zest while still warm. I totally agree! Who knew when we started the FFwD adventure that it would culminate in Seattle with a fun group of us meeting Dorie!!! I loved meeting you, Patty. I loved meeting you too Liz! I so wish I could have been there and heard all the stories. Your pics looked like you were having a blast. That is so cool how Dorie didn’t think she was reaching anyone. I can’t wait to hear more about your trip and I have to find some lemon verbena. Actually next year I need to be sure and grow some. Welcome home. Let’s get together soon so I can hear more about it. I’ve had the Punitions from Poilane in Paris and they were amazing! I wished that there were more flavors so I’m going to have to drool over your photos Patty! I can’t wait for your photography post, the conference is certainly going to go down as one of the best memories, for sure! How fun!! I was a member of Tuesdays with Dorie – my first official introduction to the world of pie crusts, yeasted breads, and food blogging in general. *Loved* every second! Your punitions are exquisite! Gorge styling. Such a great recap of an astounding weekend that I am still processing. For the record, your photos have always been an inspiration to me Patty. And so are these cookies! I think I will do some cookies next week to commemorate our Dorie encounter as I can see here how fitting a tribute they are. Beautiful! I’m charmed by the hues of green wrapped in buttery shortbread! A sparkling post filled with fragrant cookies and marvelous friendship! Glad to know that you had a great time in Seattle, Patty. Those shortbread cookies look wonderful. Welcome back, Patty! It sounds like you had a great time in Seattle and IFBC. That would be a highlight experience meeting and attending a presentation by Dorie and Andrew and meeting up with an online group you’ve been in touch with over the years. Beautiful, delicate tea cookies! I’ve never tried lemon verbena – will have to! It really was a special weekend Patty! So many wonderful memories. Life is sort of overwhelming me at the moment. I wish I had more time to get my thoughts together on everything but it is not to be. Nice post and you summed up Dorie’s address perfectly. It was wonderful meeting you! Beautiful photos of delicious looking cookies. Beautiful shortbread, I love the scalloped edge! I too, am in total agreement! It was such a great weekend, and so great meeting you, Patty! Funny how that works when you bring kindred spirits together. Dorie was so inspiring! And I loved Andrew Scrivani’s session! The cookies look and sound fabulous! Hope to see you while in SF. I loved seeing your adventures on FB and Instagram while you were in Seattle. Looks like a fun time was had by all and I am so happy you got to meet your idol – that is so fun! These cookies look and sound simply amazing! A must make. Look forward to your next post! I loved your recap of Dorie’s keynote, Patty. I could not take my eyes off her during the whole speech. Meeting and talking to you all through the weekend was one of my favorite parts of the IFBC weekend. There’s no lemon verbena at my farmers market. Maybe these could work with lemon balm (melissa) and lime zest? Also loved the camaraderie of the Doristas and your take and retelling of Dorrie’s talk is spot on. Such a lovely women- makes you want to be her when you grow up Gorgeous cookies- loving me some Lemon Verbena. So great to meet you!! It sounds like it was a wonderful weekend! Cher mentioned the photography workshops, too. It’s great that you came home with inspiration on all fronts. Those cookies look like a perfect way to celebrate. It was a wonderful weekend and you were missed! Thanks Cher! Loved meeting both you and Joe ;). Looks like you had fun on your travels after the conference, so glad you made the trip. Lovely cookies and post Patty. I wish I would have been there too sounds like a lot of fun. It is amazing that through blogging we have so many wonderful friends all over the world and who would have thought it possible even just 15 years ago. Looking forward to your next post on the photo workshop and loving your inspiration too. One of my real pleasures in Seattle was to meet you, Patty. You are delightful as well as funny and interesting and talented. Your synopsis of Dorie’s keynote address was excellent and I am in agreement that she gave us many things to think about and consider. I have never seen Dorie’s “Paris Sweets” cookbook so I thank you for posting this recipe. Your photographs are fantastic – love the green board. Now, when did you have time to do baking and painting and writing and posting? And, BTW, I won’t tell Cher we had nightcaps in the bar with Joe if you won’t. Deal? Oh, I just read Cher’s comment. She already knows. Ha ha Mary- Cher is a loyal and committed Dorista I really enjoyed meeting you! The biscuits look ideal with a cup of tea for a snack. The conference sounds wonderful. They can be so inspiring and energising. Your board is such a subtle green that I think it works brilliantly. Beautiful shortbread Patty. I loved hearing about your time with Dorie. What a special experience. Thank you for sharing all that you do with us. Your blog will always be one of my favorites. I loved meeting you last weekend, Patty! I’ve always enjoyed your blog, but now, even more that I know the person behind it all. You were really inspired by Andrew Scrivani, painting your board. The cookies look great. I have lemon verbena in my herb garden, so I’m going to try these before I lose it to the frost. Is the dough really stiff or do you think I can press it into a shortbread mold? Hi Betsy! I really enjoyed meeting you too! I was inspired by Andre Scrivani and want to make my photos look better I think after the dough has been chilled it becomes pretty stiff and should be fine to press into a shortbread mold -let me know how it works! I’m so glad you came home so inspired after getting to hear Dorie’s take about her world and the world of blogging in general. Thank you for sharing your amazing journey with us. And what a delicious way to encourage and welcome you back into your kitchen! Such a special time had at the conference. I had similar memories after my IFBC Nola conferences. LOVE these simple and lovely shortbread cookies. This is so perfect for a cup of tea after a long day! These Lemon Verbena Shortbread are so pretty and I’m sure the flavor is just as wonderful. Love lemon verbena! Loved all the pictures from the weekend in Seattle. Looks like all of you had a great time meeting Dorie! These cookies are gorgeous, and sound wonderful! How fun to hear about your weekend experiences Patty, it sounds delightful. And I love these beautiful cookies, shortbread is always a winner!